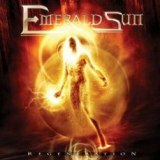 Greek Power Metallers Emerald Sun have been going since 1998, yet it’s a shame that this is the first I’ve heard of them. Regeneration, whilst not being an especially original take on a style that will be familiar to all, is at least a very competent version of it. All too often smaller power metal bands can be good at their instruments yet bad in the noises they make with them – songwriting is a truly essential skill for the genre’s practioners, and Emerald Sun here prove they have chops. Opener We Won’t Fall clatters along enjoyably, like latter-day Helloween with a touch of electronic-sounding keyboard backing giving them a certain pizzazz. Vocalist Stelios has a good voice, not especially high yet capable of hitting notes and leading the band distinctively, a band capable of almost forcing your head to nod along. Theatre Of Pain, perhaps unsurprisingly, sounds like older Edguy, drummer Bill proving he can bash with the best as guitarists Johnnie and Teo produce some wonderfully razor-edged riffage. Despite being familiar, the song is a good one, a long instrumental package working the musicians, especially the guitarists. I do enjoy the band’s diverse choice. The title track opens with keyboard ambience before launching into near-symphonic Rhapsodyian glory before switching back to the Helloweeny singalong style that works well for them. The following Speak Of The Devil is closer to classic heavy metal, mid-paced and riff-based, Edguy clearly an influence again with that uplifting and memorable chorus. I was surprised at the initially gothic-tinged melodies of Chasing The Wind, an uplifting ballad that works well despite being a typical weak point for me with less well-known bands. The inevitable twelve-minute extravaganza of Fantasmagoria raised my eyebrows in terror at first, but it’s far from dreadful, starting with over-the-top female vocals and soon leading into a terrific performance from Stelios, moving from gruff Iced Earth to near-Dio-esque heights of grandeur, atop everything from keyboard solos to bass noodles. True, there are certain down points, such as the sometimes rather poor keyboards, sounding all too often like tinkly electronic noises and capable of being slightly annoying were it not for the other instruments being given serious dominance in the mix. The band can verge a little on the silly side, too, with songs such as Where Angels Fly and Planet Metal, the latter a rather desperate attempt at a singalong we’re-all-so-cool-and-metal-together-bro anthem that might have worked were it not for the hateful cartoon squeaky voices inserted here and there. I refuse to criticise closing track Holding Out For A Hero, however, the Bonnie Tyler cover stupidly enjoyable in metallic form, female vocals returning again and giving the song the sort of poppy immediateness that non-power metal fans view with horror. In the end, although you’ll have heard it all before, this is a good enough set of songs to mean that I can recommend it to power metal fans looking for a fun listen. Hopefully Emerald Sun’s next album will develop their identity a little more.